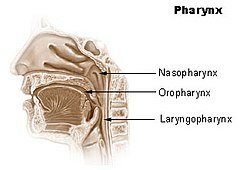 The isthmus of the fauces or the oropharyngeal isthmus is a part of the oropharynx directly behind the mouth cavity, bounded superiorly by the soft palate, laterally by the palatoglossal arches, and inferiorly by the tongue. The fauces are regarded as the two pillars, formed by the palatoglossus and the palatopharyngeus muscle, respectively, and covered with mucous membrane. The anterior one is known as the palatoglossal arch, and the posterior one is known as the palatopharyngeal arch. Between these two arches is the palatine tonsil. Each palatoglossal arch runs downwards, laterally and forwards, from the soft palate to the side of the tongue. The approximation of the arches due to the contraction of the palatoglossal muscles constricts the isthmus, and is essential to swallowing (deglutition). Inflammation of the fauces, known as faucitis, is seen in animals. In cats, faucitis is usually a secondary disease to gingivitis but can be a primary disease. In this species faucitis is usually caused by bacterial and viral infections although food allergies need to be excluded in any diagnosis. Treatment is symptomatic and includes broad-spectrum antibiotics and in severe cases where cats are inappetant, corticosteroids (often given as depot forms, e.g. depomedrol) or chemotherapy (e.g. chlorambucil).